It’s summer time, and there’s nothing better than sitting on the porch with a tall cool glass of iced tea; that is of course unless your iced tea is spiked with whiskey. Although sweet tea really ain’t my thing, I’ll make an exception where a cocktail is concerned. 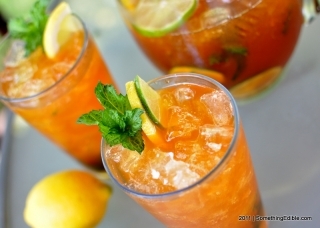 This Bourbon tea refreshes with a kiss of mint, quenches with two types of citrus, and goes down easy courtesy of the unfettered sweetness of raw sugar playing nice with with the flavors that make a Bourbon what it is. Forget about Tennessee Tea; hell, there isn’t even any real tea in that stuff. This Bourbon tea is the real deal. Servings: Makes about 6 drinks to a pitcher. thermally-safe vessel Pyrex, stainless-steel, durable plastic or the like. instant-read themometer For testing water temperature. Using a microwave, electric kettle or whatever, heat your water to the desired temperature. Add loose tea to the French press, pour hot water over the leaves, replace the lid of the press (taking care not to yet mash the plunger) and allow to steep for 5 minutes. Press the steeped tea according to your press manufacturer’s directions and pour the hot tea into a thermally-resilient vessel, along with the sugar and the ice. As the ice melts, juice one lemon and one lime and then slice the other two for garnish. Bruise the mint leaves by wadding them up in your [clean] hand or by bruising them with a spoon in an empty glass. Into the vessel of now-sweetened tea, stir in the Bourbon, lemon juice, lime juice and mint. When ready to serve, pour into a pitcher filled with ice and citrus slices. Serve over ice with extra mint and citrus slices.